Mr. Paul Charles Dalson, age 66, passed away Saturday, February 9, 2019. He was born in Oak Park, IL on April 22, 1952 to Ralph & Maribelle (Norton) Dalson. Mr. Dalson helped his father with farming, worked at Goodwill Industries and attended Spring Street Adult Education Program. 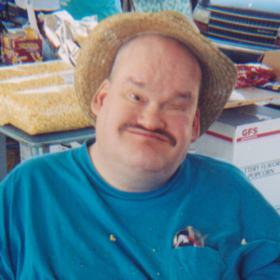 Paul enjoyed identifying & drawing tires, bowling, jigsaw puzzles, reading cook books and was a fan of I Love Lucy. Sister, Carol Dalson of Twin Lake; niece, Shannon Dalson of WI. He was preceded in death by his parents; brother, George Victor Dalson. Wednesday, February 13, 2019, 1:00 PM with visitation one hour prior to the service at the Clock Chapel - Muskegon. MEMORIAL: Paul's Place AFC Home. Please visit www.clockfuneralhome.com to leave a memory or sign the online guestbook.